Fat injections to the face are a common treatment for a variety of soft tissue deficiencies from aging. They are done alone or in combination with other facial rejuvenation procedures. Their popularity lies in the virtually scarless harvest method (liposuction), the relatively low volume need for facial applications, and ease of placement. (injection) There also seems to be very little downside with such fat transfers as the risk of complications is negligible. Despite all of these benefits, the one significant aesthetic downside to fat injections is their unpredictability of volume preservation. The fate of fat injections is well known to be ‘predictably unpredictable’. 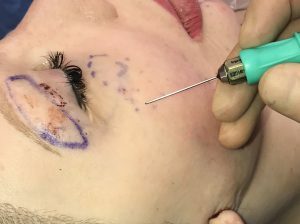 Despite a wide variety of harvest, preparation and injection strategies, fat injections the face are still not a completely reliable procedure for some patients. While loss of injected volume is the most recognized problem with fat injections, the reverse also occurs. Fat volume that is either excessive or has formed an undesirable lump or contour issue poses a different type of problem, one which requires fat removal. While fat is relatively easy to introduce into the face, it is far more difficult to remove. 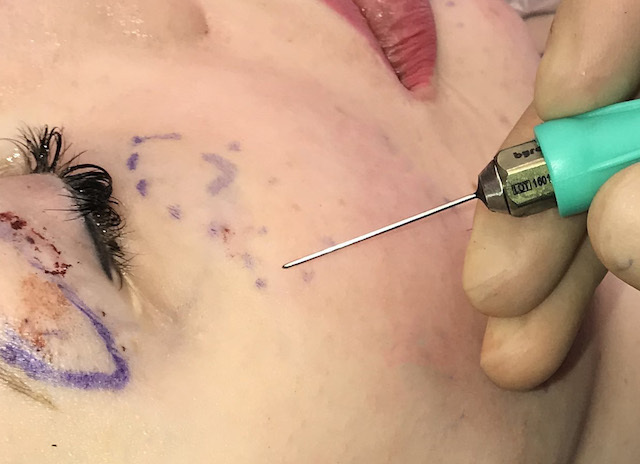 The traditional perception of facial liposuction using standard cannulas is problematic The size of the cannula creates contour irregularities as well as entrance incisions that are too large. These are particular problems in more central facial areas such as the cheeks and undereye areas. The technique that I have found useful is ‘nanoliposuction’. Just like nanofat injections using very small injection cannulas with ultrafiltered fat, nanoliposuction uses small injections cannulas attached to wall suction. Nanoliposuction of the face uses entrance sites from needle punctures which leave no marks. This technique also removes small particles of fat very slowly from the narrow diameter cannulas so there are no risks of overcorrection or removing too much fat. For small areas of injected face excesses, nanoliposuction is a technique that has no aesthetic downsides from performing it.